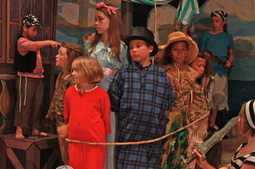 First Act's Summer Production Camps offer a full week focused on developing a scripted play. Students dive into the theatrical and creative process through workshops which give students the opportunity to participate in audition training, acting techniques, stage combat, movement, set and props creation, makeup and costume design and challenging rehearsals for a fully staged summer production. No preparation is necessary; all students receive a role and attend rehearsals culminating in two fully staged and costumed performances.